Alt Summit Hangover (noun); happens hours after returning from said blog/design conference. You now have a million new blogs to read and follow, at least fifty collaboration ideas, luggage explosion, a shoe box full of business cards to go thru, and morning gift bag withdrawals. How was Alt you ask? Well, the days went by so fast, the panels were packed full of solid advice and perspective and so many new friends were met. Alt Summit 2012 is officially over and now the countdown begins for 2013. In place of a traditional camera, I decided to take along my Fuji Instax to the conference and snap some instant film shots of all the fun new friends I got to meet. So, without further adieu, I introduce to you..... the first installment of the 'Alt Summit All Stars'! Colleen :: This adorable gal is the face behind 'Inspired to Share'. You can see a few shots of our Smilebooth takeover here. Brooke + Summer :: This quirky and fashionable duo make being the 'Girls With Glasses' super chic. 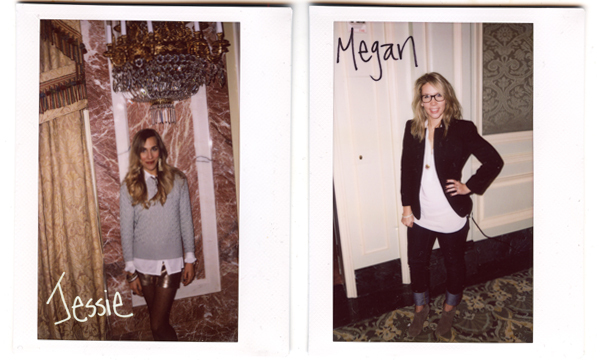 They were also the hosts of this years Paris-themed mini-party with Pinhole Press. Tara :: This 'Savvy Southerner' is my go-to for all entertaining and decorating tips. She's one to know given her days are spent running a phenomenal event company. Jessie :: Talk about killer style on a budget. You'll be dripping with envy if you knew the great steals and deals she finds on fabulous vintage pieces. Want to see for yourself? Follow her at 'Style and Pepper'. Megan :: The creative brain behind 'The Fresh Exchange' and a co-founder of Blog Brunch. We were basically connected at the hip during the conference. So whatever she says she did in her recap, I was probably there with her. The witty Jason Hudson referenced us as a 'package deal'! I'm sure y'all have had your fill of Alt Summit recaps, so I thought I'd pass you along to the talented bloggers below who did a fine job with laying out how it all went down. Old Sweet Song :: She nailed it. If you read one recap - this one is it. The Jealous Curator :: You'll spy my top knot making an appearance on this great roundup of the conference. Nat The Fat Rat :: Took the gold medal for the best outfit at the 'Winter Wonderland' party in my book. Tune in tomorrow for the second installment of 'Alt Summit All Stars'!